Shouts of "give us a clue" and "chaos" emerged from the Labour benches as John Bercow confirmed he remains unclear about when Parliament will officially return. Uncertainty remains over whether the Queen's Speech will take place as scheduled on June 19, with talks ongoing between the Tories and the Democratic Unionist Party about a deal to prop up Mrs May's minority government following the snap election. Speaker Mr Bercow, outlining the process to swear in MPs, said extra time will be made available "on the day of the Queen's Speech" although he was unable to offer a date. Labour MPs could be heard making jokes about when the Queen's Speech will emerge, with Prime Minister Theresa May watching on from the Government benches. Mr Bercow, to laughter, added: "I'm not in a position to divulge any further information on that matter." Parliament is inching closer to its return with those elected on June 8 completing the formalities needed to confirm their positions as MPs. All MPs are expected to be sworn in before the State Opening of Parliament to enable them to speak in debates, vote and receive a salary. Mrs May led her Cabinet in retaking their Commons seats, opting to swear the oath of allegiance to the Queen rather than affirm. She said: "I swear by almighty God that I will be faithful and bear true allegiance to Her Majesty Queen Elizabeth, her heirs and successors according to law, so help me God." Mrs May followed Mr Bercow and Father of the House Ken Clarke, the Conservative MP for Rushcliffe. The start of the swearing-in process followed a Royal Commission in which MPs were summoned to the House of Lords to hear the Queen had approved Mr Bercow's return as Speaker. The swearing-in process will continue on Thursday and extra time will be made available if required. Sinn Fein on Tuesday dismissed speculation that they would take their seven seats in Westminster to help Labour block Mrs May's Queen's Speech. 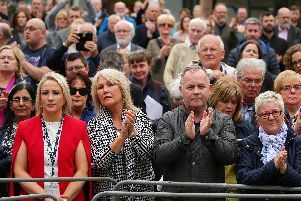 The Irish republican party has traditionally refused to take its seats out of opposition to Westminster's jurisdiction in Northern Ireland and the oath to the Queen.